Report: Donald Trump spied on Mar-a-Lago phone conversations. 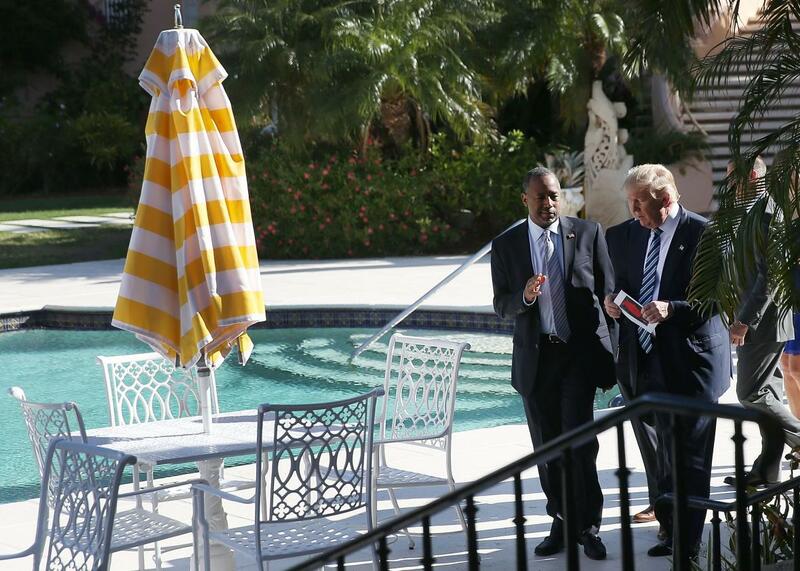 Donald Trump and Ben Carson at Mar-a-Lago. Not pictured, Trump’s switchboard. This is potentially very creepy: BuzzFeed’s Aram Roston has a bonkers scoop that four former employees at Donald Trump’s Florida resort Mar-a-Lago say he had a telephone console in his estate bedroom that he used “to eavesdrop on calls involving staff.” Two other former employees confirmed the existence of the private switchboard but denied it was used to spy. The four former Mar-a-Lago employees would not go on the record with their names because of nondisclosure agreements, but they told the site that Trump listened to calls between club employees as well as between staff and guests in the mid-2000s. At Mar-a-Lago, “He listened in,” said one source with deep knowledge of the working of the phones and Trump’s phone use. This person added that workers were told to be aware of it. For example, this source recalled a time when a staff member was on the phone with a club member. During the phone call, Trump called the staff member on another line to weigh in on the very issue that was being discussed. “There is no other way you could know what that conversation was about unless you were eavesdropping,” this source said. Two other BuzzFeed sources said that staff were generally aware of what was going on. One said that a light on a separate employee switchboard would come on when Trump was listening in on calls, and the other said that certain executives could tell when they were being listened in on because a light on their phones—but not on other phones in the estate—would turn on if Trump joined a call. The fourth source said that the resort’s phone network included “barge-in” capability that allowed for discreet monitoring of network calls by certain users and that Trump took advantage of this. None of the sources claimed to be aware if Trump monitored conversations between resort guests and nonstaff members, or whether he was currently monitoring calls at the estate. John Velez, the former Mar-a-Lago director of security, told BuzzFeed that Trump had the switchboard, but it was “ridiculous” to say Trump could listen in on phone calls and that instead he used it to dial individual suite numbers, which were difficult to remember without such a line. Trump’s former butler, Anthony Senecal, said he used the line to connect with friends who stayed at the resort without having to go through the front desk. He was unaware whether or not it had eavesdropping capabilities. Trump has said that as president he would “err on the side of security” when it came to the NSA’s metadata collection program.